FIRST Tech Challenge (FTC) Teams 5040 and 10464 both competed in the West Virginia FTC State Championship on December 2 in Fairmont, WV. Team 5040 (Nuts & Bolts) was captain of the winning alliance and qualified to move on to the FTC World Championship in Detroit in April. This is the third consecutive year that the team has qualified for the world competition. 5040 also received third place for the Design Award. Both teams will be competing again this month. Team 10464 will compete on December 8 in Pennsylvania and 5040 will compete in Dayton, OH, on December 15. Loveland FTC teams are supported by their many generous sponsors, including Blue Chip Consulting, P&G, Jarvis Global Investments, Loveland American Legion, GE Foundation, Johnson Controls, and the Loveland Robotics Boosters. The program is always in need of sponsors and mentors. For more information, go to lovelandrobotics.com or email stewaram@lovelandschools.org. 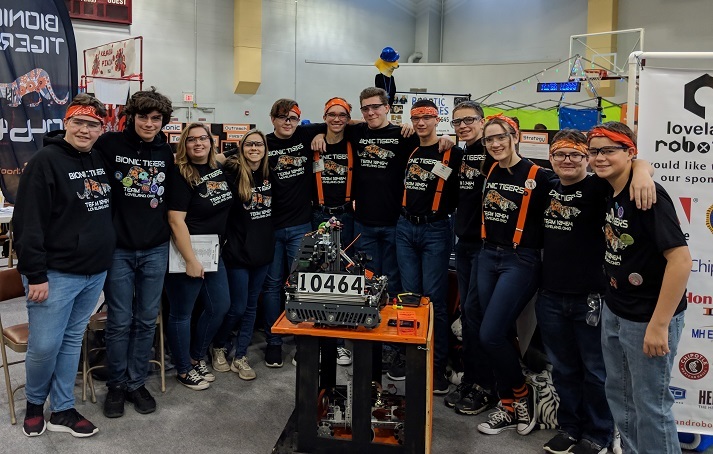 Photo caption (top image): Loveland Robotics Team 5040 (Nuts & Bolts) has qualified for the FTC World Championship, which will be held in Detroit in April 2019. Photo caption (bottom image): Team 10464 (The Bionic Tigers) competed in the West Virginia FTC State Championship, bringing home several awards.